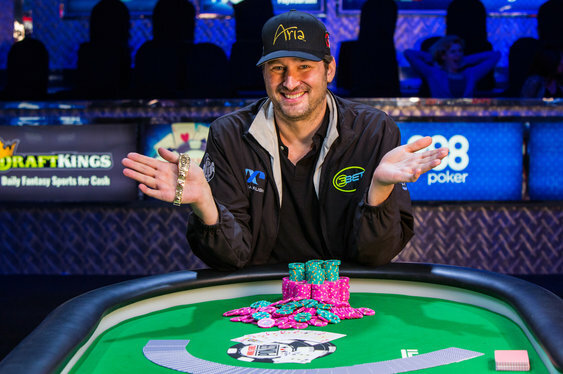 Love him or hate him, Phil Hellmuth has a knack for winning at the World Series of Poker and he proved that again this morning by winning his 14th bracelet. The self-styled "poker brat" often divides the community both when it comes to a discussion about his attitude off the felt and his skills on it, but earlier today Mr. Hellmuth silenced everyone by braking the bracelet record yet again. Having previously built up a fearsome reputation in Hold'em events at the WSOP, Hellmuth has since branched out into other disciples and that seems to have paid dividends recently; not least in the last 24 hours. After lining up alongside 103 players in the $10,000 Razz Championship event on Saturday, Hellmuth eventually came through the crowds last night to book himself a heads-up match with Mike Gorodinsky. With the likes of Erik Seidel (US), Shaun Deeb (US), Stephen Chidwick (UK) and Adam Owen (UK) all now watching from the crowded rail, Hellmuth set about wearing down Gorodinsky in search of bracelet number 14. Holding the chip lead for much of the final table meant Hellmuth was pretty much in control when it came to the final showdown with one-time bracelet winner Gorodinsky. However, as the match wore on the lead changed hands and with it Hellmuth's demeanour shifted. Fortunately, there were to be no blow ups as Hellmuth quickly regained the lead and within a few hands he'd managed to cripple his opponent. Now looking to land the knockout blow, Hellmuth eventually sealed the deal with a (7x, 6x)/4x, Kx, 10x, 2x/(Ax). That hand was enough to beat Gorodinsky's failed ten low and, with that, the final pot, $271,105 and a record setting 14th WSOP bracelet was pushed Hellmuth's way. After having a quiet word with Gorodinsky, Hellmuth soaked up the applause of the crowd before posing with fans on the rail and explaining his love for the game. "I'm dedicating this. I lost a friend about a month ago, Dave Goldberg. I’m going to give this bracelet to his wife and kids. This is for Dave Goldberg. Goldy, I love you."